Welcome to Danielsrust Game Farm in the district of Krugersdorp in Gauteng South Africa. We focus on outdoor adventures and Team building and offer our clients an escape from the city into the beautiful savannah grasslands of our privately owned game reserve where over 700 head of game roam. Explore this paradise either on horse back, quad or open game vehicle. Imagine doing Clay Pigeon Shooting, Paint ball or Archery as a family or corporate group in this unique setting in the Gauteng Province near Johannesburg. 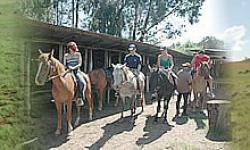 We cater for all levels of Horse riding experience. To make your ride more comfortable we suggest wearing closed lace-up shoes and long trousers. Riding hats are not supplied but you are welcome to bring your own. The quad rides are essentially slow, Game Viewing rides. We cater for all levels of experience. Children must be 13 years old to ride their own quad; younger children may pillion with an adult. As the route is eco-friendly, the ride is slow and relaxed with lots of photo opportunities. This is a great team-building activity. 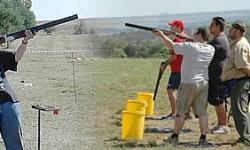 The shoots includes guns, ammunition and clays. The package of 150 shots can be shared by any number of people. It is an activity suitable for both men and ladies and is extremely good fun. Can be offered at venues or facilities of your choice, as it is completely mobile. Another great corporate or Team building activity. A great activity to be enjoyed by both men and women. A great corporate activity when large groups of people need to be entertained. The pricing is fixed by the hour, irrespective of the number of persons. This activity is also totally mobile and can be offered at alternate venues. 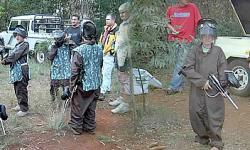 We play paint ball on our bush range where there is sufficient cover from the hail of balls. Throw down the gauntlet to friends, colleagues, rival departments at work and come and have some fun. All equipment is supplied. We have large herds of game on open grassland so your sightings are guaranteed. Groups of 16 persons or less can be accommodated on our open vehicle. Larger groups can be accommodated on a tractor-drawn trailer, which makes for a very unique experience. The accommodation on Danielsrust is either camping at Camp Shabanga, a true bush experience with no electricity, only hot showers and flush toilets, or staying in the rustic Tobacco Kiln, which sleeps 8 persons comfortably and does have electricity. Alternate accommodation in safari tents or at the luxury V.I.P camp can be arranged at the neighbouring lodge in surrounding Krugersdorp district. In The Schoolhouse, a rustic old shed, we can cater for planning meetings, ?bosberaad? and mini- conferences with a difference. For more conventional conference facilities we can accommodate you at the lodge next door.